Guided meditation is simply practicing meditation with the help of a guide. The guide can be a meditation teacher, a video, or a sound recording. Most guided meditations adhere to this general format: Your meditation guide will ask you to sit in a comfortable seated posture. You will then listen to your guide while they lead you through a series of relaxing visualizations. As you gradually relax and become more and more still, stress fades away, your mental chatter quiets down, and you are able to enjoy the present moment. Almost all types of meditation have these four elements in common: (1) a quiet location, (2) a comfortable posture, (3) a focus of attention, and (4) a mindful attitude of allowing thoughts to come and go without judging them. Time Management – Setting aside time for your meditation is one of the most important aspects of this practice. If you do not make conscious effort to setup a regular schedule to meditate, then the chances that you’ll actually practice are very low. This is nothing personal, but simply a reflection of our human nature. I recommend that you start with 5 minutes of mediation and slowly work towards longer periods of time. Ideally, it is great to meditate every day, but even a few times a week is better than none at all. Ultimately, it is up to you as to how often and how long you want to mediate. As with any personal development endeavor, it will require self-discipline and self-responsibility to accomplish the goal. Quiet Atmosphere – In order to get the most from your meditation, it is best to immerse yourself in a quiet atmosphere. It is easier to access that place of calmness within you when there are fewer distractions. If you can meditate in the same place, then all the better. When you practice meditation in the same room over and over again, the energy within the space becomes magnified and helps to support your meditation efforts on an ongoing basis. Being Present – Once you have set aside time to meditate and find yourself in a quiet place while seated in a comfortable position, allow yourself to be fully present in the moment. When you have completely surrendered to the NOW, you are giving yourself the gift to fully experience the benefits of meditation. If your mind is racing with anxious thoughts, imagine yourself placing all of your worries into an imaginary rock. Your problems will not magically disappear, but you can place them on temporary hold so that you can simply enjoy the moment. Focus Your Mind – When you give your mind something to focus upon, this makes it easier for your mind to stay present in the moment and not wander into the land of scattered thoughts. These are the tools that I use to help focus the mind: Breathing, Music, Toning, and Guided Visualization. If your mind starts to wander, come back to your breath. Be mindful of your breathing by noticing your breath flowing naturally in and out of your body. As you inhale, feel your abdomen rising. As you exhale, feel your abdomen gently go down. Music can be a powerful catalyst and can help you enter into a meditative state more easily. Here are some of my favorite artists. I recommend that you do your own exploring to see which ones resonates with you: (1) Tom Kenyon, (2) EquiSync, and (3) PowerThoughts Meditation Club. The art of toning involves repeating a word or set of words over and over again. This technique helps to strengthen your intention and integrate the vibration of the words into your energy field. If you would like to develop more compassion and empathy, an example of a mantra that you could use would be: I Am Kind. Sometimes it is easier to access a calm state by listening to the soothing voice of a guide leading you through a meditative experience. It could be a simple 5-minute centering exercise, or a more involved meditation where you are taken on a journey to explore an interesting place such as the forest or a tropical beach destination. Listening to this two-minute guided meditation that I voice recorded for your use will help you develop a more positive mindset. You can download and listen to this calming technique whenever you would like to feel inspired and uplift your vibe. It is based upon the Quick Coherence Technique from the HeartMath Institute and I hope you enjoy it. This quick heart-centered breathing technique can be used to reduce nervousness before beginning a new task, dealing with stressful situations or if you just need a moment to pause and take a break from your daily activities. When you are ready, find a comfortable position and close your eyes. Pause. Focus your attention on your breathing. Let your breath flow naturally in and out. Allowing yourself to let go and completely relax. Now imagine yourself breathing in and out through your heart. As you breathe in and out through your heart, think of someone or something in your life that you are grateful for. Pause. As you recall this person or place that makes you feel happy, allow this feeling of gratitude and appreciation to flow throughout your entire being and into every cell of your body. On your final inhale, think about this moment and know that you can access this place of calmness within you whenever you need it. Pause. I hope you enjoyed this meditation and have a wonderful day. 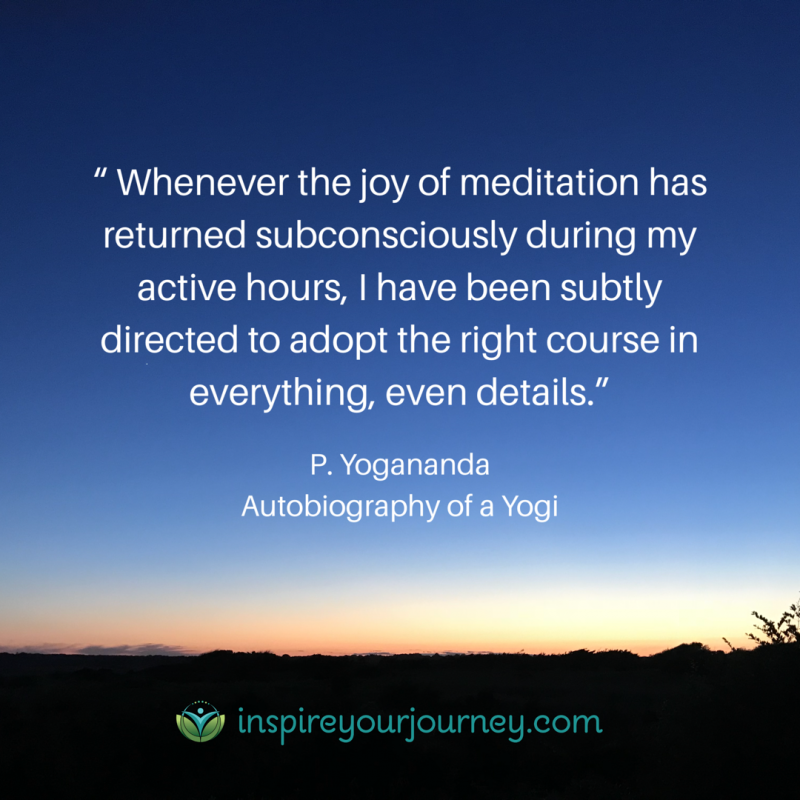 If you are interested in experiencing a guided meditation, you may contact me via phone at 508-282-7877 or email at susan@inspireyourjourney.com for a FREE Consultation today. I would be happy to talk with you about the benefits of meditation and I can always customize a meditation to suit your particular needs. In my previous blog, Determining the Real, we talked about the importance of staying true to yourself by listening to your gut feelings and intuitive hunches. It is crucial to pay attention to these inner cues and act upon this guidance if it is going to fulfill its purpose and propel your life forward. Luckily, I was given the golden opportunity to practice my own advice during May of 2018. As some of you know, I recently decided to rent my own office space in order to promote my business, Inspire Your Journey LLC – a company that is 100% dedicated to helping people transform their wellness goals into action. Inspire Your Journey offers Holistic Health Coaching, Reiki Energy Balancing, Guided Meditations, and Educational Seminars to individuals, groups or small businesses looking to bring the benefits of holistic wellness into their workplace: a decrease in stress and anxiety, improved morale, consistency, and stability. I enjoyed having my own practice space but, even better, I LOVE being surrounded by a community of like-minded people. Over time, I realized that I could only obtain this type of support system by being affiliated with an organization that was firmly established in the community. I was excited to start my new business venture, but I hadn’t considered all the moving pieces that are required to grow the business most efficiently. Inspire Your Journey has much to offer, not only to clients, but to the community at large. After much contemplation, I decided to connect with a local wellness center and work in collaboration with other people who have the same goals and aspirations as the mission of my business. The mission of Inspire Your Journey is to help people transform their wellness goals into action and achieve total health of their mind and body with ease and grace. The result? When you are able to achieve total health of your mind and body with ease and grace, you are able to experience more happiness, inner calmness, and balance in your life. When I first stepped into the SheBreathes Balance & Wellness Studio, I was WOWED by the positive energy imbued throughout the physical space. As soon as I walked through the door, I was greeted by an atmosphere of joy. As I perused the studio, I allowed myself to soak in the healing vibrations which felt wonderful. Yes, within this space, there was something special that I couldn’t quite articulate into words, but it felt enlivened with a beautiful energy. It was almost like being transported into another world – one where I felt buoyed by the enchanting ambiance as I breathed the scent of lavender essential oil being diffused throughout the air. And then I met Jennifer Gulbrand, the owner of SheBreathes, and it was easy to see why this place was humming with such an incredibly uplifting vibe. Jennifer is excited about her mission which is reflected in her words, mannerisms, and the dedication she shows to the SheBreathes Balance & Wellness Studio. SheBreathes Balance & Wellness Studio is a women’s community and collaborative dedicated to the education, empowerment, and advocacy for the renewal of women’s mind, body and soul. Men are welcome to join this community too, although the main focus is empowering women to reach their full potential. The mission of SheBreathes substantiates the mission of Inspire Your Journey which is why I chose to work with Jennifer. In order to get a clear picture of where our life is headed, sometimes we need to pause and slow down. The process of being self-aware begins with knowing what we want and what holds value for us. I honor heart-centered friendships and strong community relationships which is why I decided to corroborate with SheBreathes Balance & Wellness Studio. What makes your heart sing? What brings you joy? It is imperative that you know the answers to these questions so you can create the life that you desire. Otherwise you will be searching for the answers outside yourself when they can only be found within. If you are going through a transition in your own life and need clarity, you can begin the process of self-awareness right now by practicing my “Looking Within” meditation that I’ve shared below. Your intention creates the spark that moves your life forward. This intention cannot be found in a video game, a TV show, or your iPhone. It is a part of your core being and the reason why you are here. If you get lost in the loudness of life’s distractions, you can use this meditation to gain more insight into the direction of your life. Find a quiet place where you can relax and not worry about being distracted. Even if you only have 5 minutes, this is adequate. Take a few deep breathes – in and out – in and out – Focus on your breathe moving freely in and out of your body. As you continue to inhale and exhale, imagine the air that you are breathing is infusing your entire being with calmness. If you can’t feel the sensation of being relaxed, then state out loud: I am Calm. Keep repeating this mantra until you feel the link to your inner peace. Project your intention from this state of calm power. If you are unsure of what to intend, then ask yourself: what makes my heart sing? what brings me joy? These questions can be your intention. Allow the answers to manifest. You may get insights right away, or they may manifest in the future. Trust that divine timing is the right time. A few notes about this meditation – focusing on your breathing gives your mind something to do and helps you to stay present in the moment. Intuitive insights are able to come forth much more easily when we are in a state of calmness. This is why it is important to connect with your inner tranquility. If you find it difficult to completely relax, then a Reiki energy balancing session can help you to access your inner calm. You can read my blog, Reiki Goes Mainstream, to gain a better understanding of Reiki’s powerful healing benefits. There will always be challenges during our life’s evolving journey, but there are solutions to overcome them. The key to navigating through the changing landscapes with ease and grace is being aware of your perspective – are you viewing these changes as obstacles to your personal growth or opportunities to heighten your development. Obstacles can be viewed as opportunities when we use them as stepping stones towards our progress and transformation. I used my business situation as an opportunity to grow rather than allowing it to become an obstacle to my evolvement. And you can do the same! For questions regarding Inspire Your Journey’s holistic wellness program, you may contact Sue directly at 508-282-7877 or email at susan@inspireyourjourney.com. As I continued to practice, it became apparent that there are many advantages to this form of energy balancing. Of all the benefits that are attributed to this ancient healing technique, I find the deep relaxation that is felt during and after a session is one of the most profound aspects of the Reiki experience. In addition to the calmness, physical healing may also occur. In 1996 my neighbor Bill (name changed for privacy reasons) expressed an interest in trying Reiki. He was not familiar with Reiki but was simply curious, so we scheduled a session. During the treatment, I felt more energy around his ears in the form of greater heat and tingling sensations but did not think anything of it. I was following my intuition and listening to its guidance. A year after this Reiki session with Bill, I was having a conversation with my mother when the topic of Reiki arose. As we were chit-chatting about the sensations one may feel during a session, she paused suddenly and said, “Oh, you know Bill no longer needed that ear operation after you did the Reiki on him.” I was surprised to hear this feedback as I was not aware that Bill had any medical issues at the time of the appointment. During our talk, my mother informed me that Bill had an operation scheduled within the week following the Reiki session in order to remove a tumor from one of his ears that was impeding his hearing. Even though Bill and I had discussed the reasons why he wanted a Reiki treatment, he did not reveal his therapeutic background at the time of our appointment. Within a few days of doing Reiki, the tumor had essentially ‘disappeared’, and Bill no longer needed an operation. The doctor was perplexed at the drastic change for there was no logical explanation for the progression of the events. To date, I have no scientific evidence which proves that the Reiki given to Bill caused the shrinkage of the tumor. However, the coincidental timing of these events suggests that the Reiki might have a played a role in the final outcome. At this point it is imperative to state that Reiki is not a diagnostic tool. The practitioner does not in any way attempt to define the medical or psychological needs of a client. Anyone seeking Reiki treatments who has a medical condition should seek an appropriate medical professional. The most important lesson that I learned from my experience with Bill was the validation that there is a higher intelligence to the universal life energy that flows through a practitioner. The energy knows where it needs to travel, and the practitioners are simply conduits for this higher force to move through us. During February of 2018, in two separate instances, I performed Reiki on clients who were lying on their backs, facing upwards. At the end of the sessions, both of these clients reported that they had felt heat on their lower backs even though I did not place my hands on their backside. It was as if there were heating pads on the lower region of their backs, they said, which felt comforting and reassuring. These experiences have consistently demonstrated that this omnipresent energy has an intelligence that is far more sophisticated than what we can comprehend from our physical level of perception. This is why I always ask for the highest and best outcome for the client, releasing all expectations and allowing the energy to flow unimpeded. There are many factors that go into a Reiki experience which can impact the aftereffects of each session. The state of mind of the practitioner, the openness of the client, and the dynamics of destiny all play key roles in determining the potential outcome. Ultimately, I believe that the divine will of the individual receiving the Reiki has the greatest impact on the results. Reiki treatments are gently balancing and support the well-being of the recipient in a holistic and individualistic way. Relaxation, pain relief, physical healing, and reduced emotional distress are among the benefits attributed to Reiki. Relaxation in itself offers a host of benefits for the mind and body including a heightened sense of well-being, release of painful muscle tension, and relief from anxiety and depression. In addition, relaxation has been shown to help restore immune function and promote restful sleep. In the mid-1920s, Dr. Usui met Dr. Hayashi, a forty-seven-year-old naval reserve officer who spent most of his working life in the armed forces but had a long-held interest in the spiritual path and healing arts. Dr. Hyashi opened a Reiki clinic in Tokyo and is credited with formalizing the system of hand positions for use in a more clinical practice setting. Reiki was introduced to the West by Mrs. Takata from Hawaii, who received Reiki attunements from Dr. Hayashi. She brought it to the USA in 1980. Reiki is not only being utilized in Boston hospitals, it is also being used by a rapidly growing number of hospitals all over the world. Reiki complements medical treatment due to its ability to promote relaxation, alleviate pain, and reduce anxiety for both the patients and their family members. Reiki is appropriate for patients in any state of health and is easily implemented in all hospital environments, from outpatient clinic to intensive care. Reiki is gentle enough to be offered to pregnant women, children, and patients with a wide range of ailments, including those with cancer or recovering from surgery. The ability to heal physical, emotional, and mental imbalances with energy channeled through the hands has been viewed as a rare and mystical gift requiring great spiritual achievement. However, this simply is not true. Healing energy can be channeled by anyone who has the right intention and wishes to be conduit for universal life energy. It is interesting to note that Dr. Usui intended his system to assist people to become enlightened. Physical healing was a side effect rather than the end goal. Whether you are seeking enhanced physical wellness or more balance in your life, Reiki offers comfort, nurture, and support for the good health of your mind, body, and emotions. I am standing in the supermarket line, and I am doing something extraordinary. I am patiently observing the cashier as she scans each grocery item of the customer in front of me. I am, non-judgmentally, browsing the headlines of the tabloid newspapers that are displayed within reading distance. I am inextricably part of this life experience, yet not absorbed in it. I am not creating emotional opinions about the people nor the environment which surrounds me. I am not wishing that the cashier would work faster. I am not thinking about my next errand. I am here now, paying attention to this sacred moment; acutely aware of the freedom that I am feeling by not holding judgments or expectations of the experience itself. The realization is eye-opening, and I feel grateful for being cognizant of it. The event that I just described is the very essence of mindfulness. It is being mindful of your present situation without forming a strong attachment to it, especially on an emotional level. The concept of mindfulness is simple but can be challenging to execute on a consistent basis due to the busyness of our daily lives. Even though the gist of mindfulness is straightforward, most people have different definitions regarding its meaning. When I first heard of mindfulness, I thought that it meant to have a mind full of something – whether that be anxieties, worries, and to-do lists or happiness, joy, and peace. Each time that I repeated the word to myself, it seemed to imply that a ‘full mind’ was a beneficial quality to develop, and, depending upon the scenario, this mental state can be useful. For example, if you are preparing to write a thesis paper, you will need to perform major research in order to accumulate large amounts of evidence to support your proposition. This type of task does require one to fill their mind with knowledge, statistics, and scientific facts in order to establish their hypothesis. But in the area of self-help and personal development, the word mindfulness denotes quite another meaning. Because of my own ambiguity surrounding this topic, I will help to clarify this practice by sharing another a-ha moment that I experienced while taking a yoga class. What follows are the notes that I jotted down immediately afterward, when I was feeling gratitude and appreciation for what had just transpired. About half-way through today’s yoga class, there was a shift in my perception. My awareness became heightened as I completely focused my attention within the present classroom environment. The moments elongated as I reveled in the simple joy of the experience. Yes, time appeared to be stretching itself to maximum capacity. There was only the uplifting atmosphere and motivating presence of the yoga teacher. All else was blurred from my perception. I was hyper-concentrated on the here-and-now which was blissful and sweet. Like a light bulb brightening a room, the realization illuminated my awareness. I felt thankful for the gifts that were right before my eyes. The words “stillness awaits you” struck a chord of remembrance within my being. Suddenly, the posture felt brand new. I felt so welcomed by these words that I could not wait to be embraced by the peace that awaited our participation. I thought, yes, stillness awaits us because it is already within us. This is what the instructor meant by “stillness awaits you.” If we take the time to tune into our center, our soul, and our divine spirit, then we will connect to the true essence of our core being which is stillness. After class, as this awareness was moving through my consciousness, my mind kept flashing back to the days when I first started doing yoga. As a beginner, I was impatient and found it difficult to cultivate a sense of inner peace. It took some time to get to this beautiful feeling that I was experiencing today, but the good news is that it is attainable. Before fully surrendering to this act of mindfulness, I was in a continual mode of anticipation instead of appreciation, wondering what time the class would be over instead of savoring my time within it. My consciousness was not perceiving this session as a gift to be enjoyed, but rather a chore to be performed. All it took was a change in perception for the gifts to be revealed, for the gratitude to be released, for the experience to be relished. In truth, harmony and stillness are an inherent part of our being. These innate qualities are simply waiting to be acknowledged for their wonderful presence, and the tool of mindfulness allows us to be aware of their existence. In 2014 and 2017, the cover of Time Magazine highlighted the topic of mindfulness, showing just how prevalent this topic of discussion has become throughout mainstream America. But mindfulness has been around for much longer than our current timeframe. Did you know this topic is one element of the Noble Eightfold Path of the Buddhist tradition? Buddhism was founded in approximately 6th century B.C., and here we are, still talking about mindfulness. So what exactly is all this discussion about? Right View – being aware that our actions have consequences; this awareness allows us to possess the insight to karma, rebirth, and the nature of our reality. Right Resolve – having the right intention, i.e. giving up worldly desires such as power and greed to adopt peace, kindness, and compassion towards our fellow human beings. Right Speech – our words have consequences. Thoughtful communication helps to unite others, heal dissension, and move us closer to everyday compassionate living. Right Conduct – living in a moral and ethical way. This step on the path also includes a whole approach to the environment, with right action being taken to safeguard the world for future generations. Right Livelihood – job/purpose/service-to-others. Certain types of work were discouraged by the Buddha such as those dealing in weapons, and those harmful to animal or human life. Right Effort – right attitude. Akin to the strings of a musical instrument, the amount of effort should not be too tense or too impatient, nor too slack or too laid back. In order to produce Right Effort, clear and honest thoughts should be welcomed; feelings of jealousy and anger left behind. Right Mindfulness – All forms of Buddhist meditation help to develop mindfulness; Buddhists train themselves to stay alert to the present experience. They observe their thoughts then release them without judgement. Right Samadhi – a “single-pointedness of mind”; concentrating the mind on a single sensation or object to the point of absorption. All sense of “self” disappears with the subject and object becoming completely assimilated into each other. The Buddha mentions four frames of reference in mindfulness: (1) mindfulness of body, (2) mindfulness of feelings, (3) mindfulness of mind, and (4) mindfulness of dharma. Mindfulness of Body is being fully aware of your bodily functions, your muscles, and your breathing. The breath is an important factor to mindfulness of the body. During meditation, it is common practice to focus on your breathing. This is usually the first “exercise” for training the mind. We discipline our mind to follow the natural process of breathing by allowing ourselves to merge into the sensation of breath, following it through exhale. If you practice meditation regularly, you will find yourself returning to the breath throughout the day. When you feel stress or anger arising, acknowledge it and come back to your breathing. It’s very calming. Mindfulness of Feelings is the practice of recognizing and acknowledging your feelings without being attached to them. By not attaching to your feelings, you are acknowledging that the feeling or sensation is not a “thing” that you possess. There is just a feeling passing through you. It is healthy to be aware of your own emotions and not suppress them. As human beings we are very good at ignoring emotions that we don’t want to feel, but doing this could cause problems and can even make us physically ill. If you are feeling a less-than-happy emotion such as anger, it is best to acknowledge the sensation, observe it, and then allow it pass through you without judgment. Mindfulness of Mind is the process of observing mental states as they come and go, realizing how transitory and temporary these states are. Awareness of the mind involves paying attention to yourself in a detached way. Is there calmness, or agitation? Is there focus, or distraction? Do not analyze your thoughts or form opinions. Simply observe. Mindfulness of Dharma is being aware of your state of self-realization. Dharma encompasses a wide definition. It has been described as the force which upholds the nature of the universe as well as the ability to enter Nirvana and attain personal enlightenment. To the extent that it can be explained, dharma can be interpreted as both the essential nature of reality as well as the teachings and practices that enable the realization of that essential nature. To envision the evolvement of mindfulness, I would like you to imagine a world where humanity is completely in tune with one another. Each person is telepathic which means that we can read each other’s minds and use this ability to create a positive outcome. Being telepathic is a wonderful way to communicate because we would, by default, be mindful all the time. We would not only be aware of ourselves, we would be aware of others as well: their temperament, feelings, and most of all, their intentions. The transparency would help to facilitate a world where darkness would not be able to hide because peoples’ true nature would be exposed. How can there be deceit if an individual’s motives are known before he or she has the chance to implement them? Imagine a humanity living in joy, harmony, and unity with one another because the ability to realize such a community will be supported by like-minded people interested in working together for the benefit of the whole. If you think that telepathy is located in the distant future, then I will refer you to a study done by Yale Scientific in 2015. In this research, scientists were able to transmit words from the brain of one research participant in India to three other participants in France. This study marked the first time conscious thoughts were transmitted directly between individuals, offering foresight into the higher intelligence of the human race. In the Buddhist tradition, mindfulness is seen as the practice of being aware of the present moment in a non-judgmental manner. It is bringing one’s complete attention to the here and now by observing the experience without forming opinions about it. From my perspective, this is mindfulness in its purest form: simply being in the present, alert and aware, yet releasing all preconceptions and expectations. In our current world, mindfulness is alive and well. The great quality about mindfulness is that it can be practiced by anyone, regardless of religious background or beliefs. We can all benefit by feeling appreciation and gratitude for the everyday gifts that life has to offer: relishing the warmth of the sun on a cold winter’s day, hearing the unexpected laughter of a child, or savoring the stillness during a yoga class. There are endless opportunities to be mindful of the moment, mindful of yourself, and mindful of others. If everyone practiced the concepts of this technique, our planet would reflect more harmony and prosperity for all of humanity. In the future, there will be additional ways to practice the art of mindfulness, ones that are in concert with our higher-self and elevated states of reality. When you are centered and in-sync with yourself, you have the capability to make decisions from a place of inner power and stability. Like a gymnast walking the balance beam, it takes a conscious effort to remain within this empowered state of mind. But the more you practice getting in touch with the core of your being, the easier it becomes to tap into this essence and realize the benefits with greater consistency. The key to navigating your life with ease is to maintain your equilibrium within a world filled with dualities and endless activity abounding from every direction. In this blog, we will discuss the concept of duality along with a tool that you can use to develop your sense of equanimity, a state of mental calmness and stability, especially under stress, strain, or a difficult situation. Duality is an instance of opposition or contrast between two concepts or two aspects of something. As hinted by the word “dual” within the word itself, duality refers to having two parts, often with opposite meanings, like the duality of good and evil, peace and war, up and down. Similar to the concept of duality is the Chinese philosophy of the yin and yang aspects of our lives that appear to oppose another, but can actually complement each other to benefit the good of the whole. When discussing the concept of duality, it is impossible to talk about the yin or the yang without some reference to the opposite, since yin and yang are bound together as parts of a mutual whole. For example, there cannot be the bottom of a mountain without the top. There are tangible dualities that run throughout all elements of our lives. From emotional states (happy vs. sad) to personality traits (ambitious vs. ambivalent) to physical sensations (hot vs. cold). It is important to balance these quality types in order to nurture our optimal well-being. When we harmonize our inner self, we can function with more efficiency and clarity. To demonstrate the importance of balancing our dualistic natures, I will be using the example of the Type A and Type B personality types, including the yin and yang qualities that make up their character traits. The Type A and Type B personality theory describes two contrasting personality types. People who are intensely competitive, highly organized, ambitious, impatient, aware of time management and/or aggressive are labeled Type A, while more relaxed personalities are labeled Type B. This theory was developed by two cardiologists in the 1950s and had a significant impact on the evolvement of the field of psychology. Type A people are known to be high-achievers, multi-taskers, status-conscious, and proactive. People with Type A personalities are often “workaholics.” They push themselves with deadlines and hate both delays and ambivalence. They are always in a race to achieve lofty goals and cannot rest on their laurels. They have an innate need to compete. If there is no obvious competition, they will create one. As with all emotional attributes, there are consequences if these behaviors are taken to the extreme. A person with excessive Type A behavior may develop or experience the following: (1) free-floating hostility, triggered by minor incidents; (2) irritation and exasperation; (3) high stress due to competitive drive, and (4) severe edginess due to a sense of urgency. Taken to the extreme, the Type B personality may become too lackadaisical. They could lose the ambition to advance their careers or progress in their personal lives. They may become unconcerned with the details of their life because they often believe that ‘everything will work out.’ Due to this fatalistic attitude, they have a tendency to leave much of their lives to chance instead of taking the initiative to forge their own path. When viewing the differences between the Type A and Type B personality types, we see that there are positive qualities to both character traits when they are in a balanced state. When either type is taken to the extreme, this is when the irrational behaviors start to manifest. The Type A goal-driven mentality can be balanced with relaxation techniques such as meditation and mindfulness. The type B personality can be balanced by finding suitable work or hobbies that ignite their passion for living, creating a spark of enthusiasm. Before we discuss the benefits of meditation as a tool that all people can use to maintain their equanimity, I would like to share a hypothetical story of three hikers and a mountain in order to illustrate the value of balance. Three hikers were getting ready to hike a beautiful mountain in Washington State. The skies were clear and the temperature was perfect. One of the hikers, Type A, was determined to reach the top of the mountain as quickly as possible. Type A was goal focused and knew she would reach her destination in exactly two hours. Another hiker, Type B, was determined to take her time to reach the top and not worry how long it would take to complete the journey. Type B was going to enjoy herself, and this was the first priority. Balance, the third hiker, had a plan. She would arrive at the peak in approximately three hours. This would give her time to appreciate the breathtaking environment, but she would keep going at a steady pace until she reached the target. It was 8 am. If she reached the top by 11 am, this would give her enough time to explore the peak and eat lunch without having to rush. She would start her descent at 1 pm, leaving ample time to reach the bottom before it started to get dark. Type A succeeded in reaching her goal in a quick two hours. She briskly walked the path with her eyes glued towards the ground, intent on the placement of her feet. The wild roses that were blooming in full grandeur escaped her attention. Their sweet scent drifting through the air, unnoticed by her senses which were completely devoted to finishing the task at hand. A majestic bald eagle was perched in a nearby tree, observing Type A as she strode by with steadfast conviction and singular concentration on the mission. Type B reached the top of the mountain in five hours, but there was not enough time to eat her lunch and explore the environment. There was also the risk of darkness descending upon her as she hiked the long return. Type B enjoyed the delicate flowers, the bald eagle, the soothing streams, and the sauntering deer along the way. But her lack of foresight in planning this adventure was placing her in a dangerous situation of not reaching the bottom before dusk encroached upon her. I use this example as a way to show that there are benefits to being goal-focused because Type A people get the job done. They are efficient and hyper-concentrated on the final target. But they tend to miss the joys of a life fulfilled by the heart. They forgo the simple pleasures in order to satisfy their sense of duty to complete the end objective. Type B was able to reach the destination, but her lack of planning produced a stress-filled venture down the mountain. She thoroughly enjoyed the journey towards the goal but did not prepare for the entire show. She also was hyper-concentrated, but it was on the peripheral attractions, and not enough on the task at hand. Balance employed a combination of both the Type A and Type B skillsets. She enjoyed the journey to the top but was also aware of the bigger picture. She was cognizant of the fact that she had to leave herself ample enough time for the return hike as well. This idea of being mindful of the entire experience, and not just focused on one element of it, can also be applied to the way we live our lives. In this modern world, there can be many obstacles along the path towards fulfilling your dreams. These challenges have the potential to block or delay the attainment of your aspirations. Each one of us has different values, but if you can enjoy your life experience while cultivating your ambitions, then you have the best of both worlds. Luckily, there are tools that you can use to strengthen your inner balance so that you can maintain your centeredness and focus. For this blog, I will be highlighting the benefits of meditation, a universal technique that can be practiced by anyone, regardless of personality type. In 2013, a Harvard Medical School Study  sought to verify the acute benefits of meditation after just one Relaxation Response (RR) session. The researchers were interested in discovering the molecular mechanisms that were responsible for counteracting the adverse effects of stress disorders. They measured acute transcriptional changes in genetic activity after participants listened to one relaxation CD. Sample Size: 52 subjects, both RR veterans and novices. Method: Listened to one relaxation CD, twenty minutes in length. Blood Samples Taken: Prior, immediately after, fifteen minutes after listening to CD. Results: There was an increase in energy metabolism, insulin secretion, and telomere maintenance. A telomere is a region of repetitive nucleotide sequences at each end of a chromosome, which protects the end of the chromosome from deterioration and prevents it from fusing with neighboring chromosomes. There was a decrease in blood pressure, inflammatory response, and stress-related pathways. Conclusion: Human genetics are rapidly affected by RR techniques, such as meditation. Enhanced genomic activity causes physiological changes within our body via biological pathways that are linked to select gene sets. This study used advanced genomic testing to analyze transcriptional changes that occurred during one RR session. In molecular biology and genetics, transcriptional regulation is the means by which a cell regulates the conversion of DNA to RNA (transcription) which orchestrates gene activity. The regulation of transcription is a vital process in all living organisms. The findings in this study suggest that RR techniques such as meditation can help to counteract the detrimental effects of stress-related disorders such as hypertension, anxiety, diabetes, and arthritis. It can also improve energy resiliency and cellular stability. It is interesting to note that this study verified the short-term benefits of meditation. In other words, you do not have to be a seasoned practitioner in order to experience the positive effects of meditation. By simply listening to one relaxation CD, you can feel calm, centered, and peaceful. To have these effects last for a longer period of time, it is recommended to implement a meditative practice on a consistent basis. We live in a world of duality which is filled with opposing characteristics that are seemingly contradictory to one another. Even though there are yin and yang qualities that differ from each other, they are intrinsically bound to one another as parts of a mutual whole. For example, there cannot be the bottom of a ladder without the top. Just as Einstein observed that the true nature of light can only be understood by comprehending its ability to behave as both a particle and a wave, so it is with human nature. To understand our complex behavior patterns, we need to realize that there are dualistic principles that are present throughout all aspects of our lives. In order to maintain a sense of equanimity while navigating the avenues of life, mindfulness and meditation are tools that can be used to develop and preserve our inner clarity. Mindfulness, in this aspect, comes in the form of awareness. Being aware that we have a choice as to where we would like to live in our mindset. We can choose to operate on the periphery of extremes, or we can choose a more balanced approach and make decisions from the center of our being which is our place of empowerment. As we saw in the hiking example, Balance chose to combine her goal-focused determination along with her sense of enjoyment to get the most out of her experience. She saw the bigger picture, and this expanded perspective helped her to select the best course of action. During life’s most challenging and rewarding times, in the balance is where your power resides. Harrison, David (2002). “Complementarity and the Copenhagen Interpretation of Quantum Mechanics”. UPSCALE. Dept. of Physics, U. of Toronto. There are two grocery stores within a short driving distance of where I live. The closest supermarket is less than one mile from my house, and the other is a few miles away. I consistently shop at the closest store as it is more convenient, venturing only to the other for specialty items when necessary. But on this particular day, I was sensing an inner pull to shop at the farther market. I didn’t understand the reasoning behind it, but I followed my gut and drove across town. As I was perusing the food aisles, I suddenly remembered that this store had an activity billboard where local businesses are allowed to advertise their services. I decided to take a quick look at the board to see if there was anything of interest. My eyes scanned the brochures and business cards that were tacked upon the cork but nothing caught my attention. It was then, as I was about to walk away, that I saw an advertisement for a meditation center that was located in an adjacent town. I was elated. I had been searching for a local venue that offered meditation classes but did not have success in finding one online. I made a mental note that I would visit this center within the next week. As I was thinking about this coincidence, I knew why I was drawn to visiting this specific grocery store. My instinct was guiding me towards what I had been asking for all along: a community meditation center. I was lead to this information by my own inner compass which is innately intuitive and intelligent. Each and every person has access to this type of internal wisdom, but what is the source of this unseen navigational system that has our best interests in mind and knows the most appropriate course of action? The topic of spirituality has steadily gained momentum over the years, but what does authentic spirituality represent and how does it impact our everyday lives? From my personal experiences and listening to other peoples’ perspectives on this matter, I believe that the core essence of spirituality involves the process of awakening to our spiritual nature and acknowledging that a higher power exists that is greater than ourselves. This higher power has different names and labels according to one’s cultural background and beliefs. For myself, I call this force God, Creator, All That Is, or Divine Source. These are my go-to titles for an all-encompassing energy that is moving through our infinite universe and permeating our everyday lives. Awakening to our inherent essence can be considered a universal human experience. Some people may have spiritual experiences that are transcendent in nature, but I believe that we all encompass a spirit that communicates to us through intuitive insights, synchronicities, and feelings. Our spirit is the energetic principle which gives life to our physical bodies, but also provides a direct connection to God or Infinite Source. Within this dimension of physicality, any event that we experience by feeling becomes a reality for us. This is in contrast to simply observing an event as an outsider looking inward. When we get in touch with the essence of an event on a physical, emotional, and mental level, we enter that experience and understand it’s meaning on a deeper level. We are no longer on the perimeter, we are fully immersed into its presence. I became seriously interested in the topic of spirituality when I experienced an ‘awakening of consciousness’ during my senior year in college at the University of Massachusetts at Amherst. I explain this event in my book, A Spiritual Journey, but I will provide a recap here. During my adolescent years, I had always been a seeker of knowledge, yearning to understand the mysteries of the universe. I was constantly asking questions, wondering about the nature of God and wanting to comprehend how I fit into this vast world that we call planet Earth. At the time, I believed in a higher power but did not tie myself to any one particular religion or faith. In order to understand the context of the story, I will need to provide some additional background information. In 1987, when I was packing to leave for my freshman year of college, I was handed a book as an unexpected gift from a visiting friend of the family. As I gazed at this book that I was holding in my hands, my heart sank with disappointment, for it was a Bible. At the time, I thought that I would never open it. Truthfully, I had planned to leave it at home or give it away to someone who would appreciate its contents. But as I stood there looking at the cover, I suddenly felt compelled to keep it. I packed and repacked this Bible every year of college but did not read a single word. I did not know why I was doing this. It just felt right to have the Bible near me, even though I would not open it until four years later. During my senior year at the university, I was living off campus in an apartment complex with three other roommates. On one particular night, I was writing an English paper but was having a hard time focusing, as I had a problem on my mind. I was trying to decipher the best way to handle a relationship issue I was having with my boyfriend at the time. As I pondered the situation, an image of the Bible suddenly appeared in my mind, and I had a strong inclination to retrieve the book. I intended to open to a random page and take a chance that the answer to my predicament would be located on that chosen page. I had heard of other people doing this experiment with some degree of success, but I did not have faith that it would work for me. With some reluctance, I retrieved the Bible from my desk drawer. I looked at it for a moment and then propped it up on a wooden crate, before which I kneeled. I held the question in my mind and hesitantly opened to an arbitrary page. Astonishingly, my eyes fell upon words that described the solution to my dilemma exactly. I was amazed by this moment of fate, which seemed like a miracle. But little did I know that there was more to experience, for while I was contemplating this occurrence, a brilliant flash of white light suddenly illuminated the room. I looked over my left shoulder since the light appeared to be originating from the upper-left-hand corner of the room, but I did not see anything unusual there. However, as soon as I turned back and faced the Bible, I was engulfed with waves upon waves of what I can only call unconditional love. I had no idea what was happening to me, but I felt completely embraced by a heavenly presence that was coming from all directions and infusing every fiber of my being. At the same moment, in my mind’s eye, I saw numerous beams of light being directed toward my physical body. These beams looked like sun rays as their color was golden yellow. I instinctively knew that this cosmic light was the source of the divine love that I was experiencing. As the rays showered their magic, my very essence was imbued with sheer joy. I was stunned by this sudden display of affection, which left me speechless. Outwardly, my physical body remained unmoved, but inwardly I felt an expansion that was limitless and free. While I was experiencing this otherworldly bliss, I felt the abrupt sensation of being pulled up and out of my physical body. The sensation was subtle but something I definitely felt. In an instant, I seemed to be dissolving into the universe and becoming one with it. I swiftly found myself in the middle of an endless sea of deep space, but I felt very calm as I gazed upon the outstretched vista. Enveloped by a profound stillness, this nighttime panorama was quiet and peaceful. I saw distant stars decorate the great expanse, and most astonishingly, I could feel the infinite force of Life itself: perpetual energy, extending and continuing in all directions. Eventually, I could not contain the power that was moving through my body, and I began to sob. I was crying tears of elation, for I was awed by this entire experience which lasted no more than a few minutes, but changed my life forever. Surprisingly, throughout this event, I maintained consciousness of my material body and its surroundings. I was simultaneously aware of my college room with its minute characteristics, but I was also cognizant of this other dimensional realm with its celestial nature. It felt like I was in two places at once with my perception intact in both places. There are many lessons that I took away from that blessed night in college, but the one element that has stayed with me throughout these years is the knowingness that we all originated from a Divine Source. Our spirit would like us to become comfortable with this idea, and accept that, at our core, we are energetic beings having a physical experience in this third-dimensional reality of existence. We are divine. Each one of us has a direct connection to God, or Source, regardless of our religious beliefs and backgrounds. If we wish to experience a more harmonious and happy existence, it is our job to remember this connection so that we may choose our actions based on love, kindness, and cooperation with one another. We have a spirit whose wisdom is accessible when we listen to its guidance. Our spirit speaks to us through feelings, inner cues, and synchronicities. Being aware of this divine language can help us to activate the higher dimensionality of ourselves. Our spirit is self-luminous, compassionate, and blissful. We ALL have an expanded aspect of ourselves that is supporting the wholeness of our being, whether we realize it or not. Attuning ourselves to this divine knowledge is what I call Spiritual Intelligence. Implementing its wisdom into our life is what I call everyday spirituality. Each and every person has been born onto this planet for a reason. Your life matters and you are meant to be here during this time and place within Earth’s history. The key to finding your purpose is to finding your passion, i.e. those activities that make you feel alive, imbuing your life with inspiration and enthusiasm. Most people can agree that there are high levels of stress and anxiety in today’s world. Our lives seem to be moving at a warp speed and there are multiple factors that have contributed to the unfolding of this energetic phenomena. With the advent of TV, social media, and the constant broadcasting of news via the internet and radio, how do we stay in touch with our inner harmony when there is so much noise and chaos around us? This is where spirituality shines its light, offering tools of wisdom for those who wish to experience inner peace, love, and happiness on a more consistent basis. In my memoir, A Spiritual Journey, I describe methods that you can use to stay aligned to your higher self and innermost core being. I relay these helpful techniques by sharing personal stories about my own spiritual experiences. The ultimate goal is to inspire the reader with hope so that you may navigate your life with greater ease and efficiency. There are many tools which can soothe the stress and anxiety of everyday living, but the one tool I would like to mention today involves the concept of mindfulness. In my next blog, I will go into more detail about this subject, but here is a high-level overview for now. In 2014 and 2017, the cover of Time Magazine highlighted the topic of mindfulness, showing just how prevalent this topic of discussion has become throughout mainstream America. But mindfulness has been around for much longer than our current timeframe. In fact, it is one element of the Noble Eightfold Path, a set of Buddhist practices leading to personal enlightenment and liberation from samsara, the cycle of rebirth. Buddhism was founded in approximately 6th century B.C., and here we are, still talking about mindfulness. So what exactly is all this discussion about? In the Buddhist tradition, right mindfulness is seen as the practice of becoming aware of the present moment in a non-judgmental manner. It is bringing one’s complete attention on the here and now by observing the experience without forming any opinions about it. From my perspective, this is mindfulness in its purest form: simply being in the present, alert and aware, yet releasing all preconceptions and expectations. From a spiritual perspective, we are practicing right mindfulness when we are focusing on the qualities of our higher-self versus that of our lower-self. Our higher-self encompasses the values of love, compassion, and kindness while our lower-self embodies the more base emotions of hate, jealousy, and discouragement. Being mindful is being aware that we are responsible for our actions. We can choose to act with good-heartedness to uplift others, or we can act with indifference in order to benefit our own gain. This responsibility begins with our state of mind. Just as spirituality is a universal human experience, mindfulness can be practiced by anyone regardless of their faith, religious beliefs, or background. Spirituality and mindfulness are global experiences that allow us to reconnect to our true essence which is essentially our divinity. By linking to our spirit’s intelligence, we will naturally experience more harmony in our lives because we are opening doorways to our higher selves. The key to unlocking these higher doors of wisdom is to listen to the guidance of our spirit who speaks to us through feelings, hunches, and intuitive insights. Once we acknowledge the inner cues, the next step is to act upon them. As we saw in the grocery store experience, I paid attention to my gut feeling and this awareness produced a positive outcome. I could have easily ignored the nudge, but instead, I respected the information and followed its advice. When we are centered, we can hear the wisdom of our spirit through the noise and commotion of our daily lives. This is what it means to be fully aware in the present moment, and mindfulness is a tool that can help us remember our spiritual heritage and stay attuned to our divine nature.